A lynx has appeared in the Italian Alps for the first time in 100 years. The authorities in Italy's South Tyrol region say the lynx, which crossed the mountains from Switzerland, does not pose a threat to livestock in the area. The lynx was fitted with a signalling collar after being captured in Switzerland in February. Lynx were wiped out by hunters and farmers in the region in the early 20th Century. They were reintroduced in Switzerland in the 1970s. 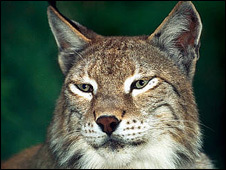 On Friday the South Tyrol authorities said the lynx spotted in the area had wandered through the Pejo Valley and had stopped in the Deutschnonsberg area of South Tyrol. The WWF conservation organisation says there are about 100 lynx in Switzerland, in two main areas: the northwestern Alps, which includes Interlaken, and the Jura Mountains near Lake Geneva. Lynx are solitary hunters, inhabiting high-altitude forests and preying on small mammals such as hares, foxes and small deer as well as fish. WWF Italy spokesman Riccardo Nigro told the BBC News website that lynx "are fully protected in Italy". But he said carnivores such as bear, lynx and wolves could be a risk in some places because alpine communities had forgotten simple preventive measures such as low-voltage fences and dogs trained to defend cattle. An Italian programme to reintroduce bears to the Alps suffered a setback when one - nicknamed Bruno - ventured into Austria and Germany and preyed on local livestock. Bruno dodged Bavarian hunters for weeks before being shot dead in June 2006.